Michael Anthony Strahan (born November 21, 1971) is a retired American football defensive end who spent his entire 15-year career playing for the New York Giants of the National Football League (NFL). 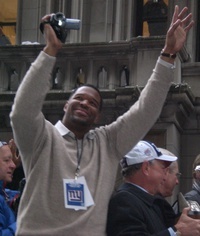 During his tenure with the Giants, Strahan set a record for the most sacks in a single season in 2001, and won a Super Bowl in his final season in 2007. After retiring from the NFL, Strahan became a media personality. He is currently a football analyst on Fox NFL Sunday, and he also serves as co-host on the television morning talk show Live! with Kelly and Michael alongside Kelly Ripa. He starred in and produced the short-lived Fox sitcom Brothers and appeared as host for Pros vs. Joes alongside fellow Fox football analyst Jay Glazer. • Kevin Hart confirms he will not host the Oscars: "I'm over it"
This webpage uses material from the Wikipedia article "Michael_Strahan" and is licensed under the GNU Free Documentation License. Reality TV World is not responsible for any errors or omissions the Wikipedia article may contain.